This is a superbly illustrated look at the finest work of 28 of the most original and cutting-edge artists and illustrators working today. 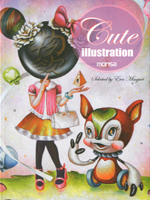 "Cute Illustrations" presents readers with a visually stunning showcase of the finest work from 28 internationally renowned artists and illustrators, including Yosuke-Uena, Fawn Gehweiler, Naoshi, and Marcos Chin. Each of the featured artists have personally selected their best, and favourite works, giving readers a fascinating and unrivalled look at the talent working at the very cutting edge of today's illustration scene.